Meet with your dentist for a consultation first. There are several different teeth whitening systems and a consultation will help you determine which technique is best for you. During your consultation for teeth whitening in Los Angeles, decide how many shades lighter you want your teeth to be at the end of the treatment. Depending on the whitening method chosen, your teeth can be lightened three to eight shades. An in-office procedure achieves a degree of lightening that cannot be achieved with an over the counter product. During your treatment, your dentist may apply a coating to protect your gums and roots while the bleaching agent is applied. An alternative protocol is to have your dentist customize a take-home kit for you. Make sure you follow the instructions precisely. First, molds are made from your upper and lower arch. Then the lab creates trays to hold the bleach. While this treatment plan may take longer, it is more economical and more convenient for many patients. Teeth whitening results from either treatment plan can last from six months to two years. With any of the teeth whitening systems, tooth sensitivity may transpire. In most cases, it won’t last for more than a day or so. Call Dr. Bill Dorfman, DDS – Century City Aesthetic Dentistry if it lasts longer. 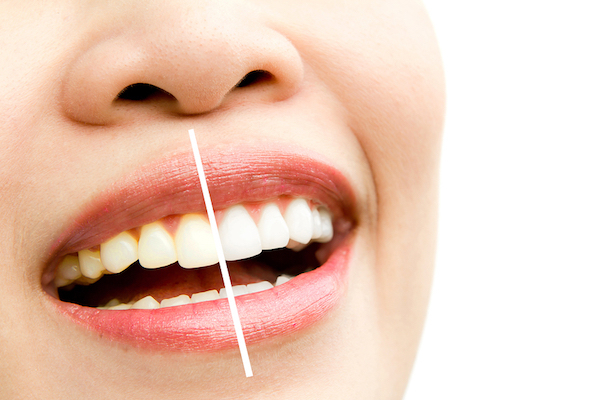 If you’re curious about teeth whitening in Los Angeles, give us a call at 310-277-5678. Dr. Bill Dorfman, DDS – Century City Aesthetic Dentistry offers general, restorative, and cosmetic dental services including sedation dentistry, porcelain veneers, and smile design. At Dr. Bill Dorfman, DDS – Century City Aesthetic Dentistry, quality care and a comfortable patient experience are our top priorities.